How has God blessed you lately? Have you seen examples of how God’s blessings to you have enabled you to bless others? How can you increasingly see those in your oikos as Jesus sees them? What things keep you from seeing the needs of others? Are you willing to pray for God to send laborers? If so, how would you feel if He asked YOU to be one of them? Hebrews 11:6 says, “And without faith it is impossible to please God, because anyone who comes to him must believe that he exists and that he rewards those who earnestly seek him.” How earnestly are you seeking Him right now? And what would it look like for you to do so? 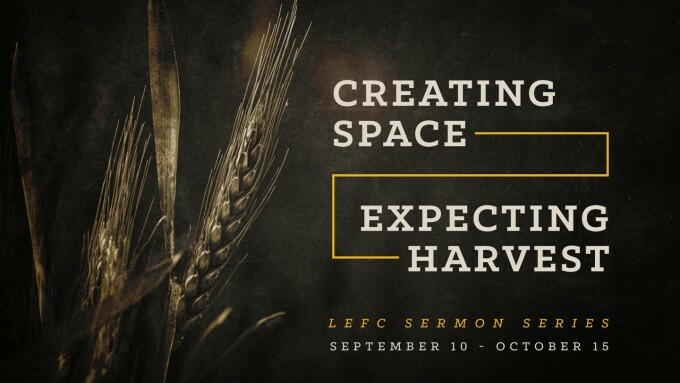 Take some time, even now, for God to send out laborers from LEFC and for God to grow our capacity to send them. Some of the tools God used to communicate (especially in the OT) and deliver messages to man were sometimes a bit unexpected (a dove, a stick, a donkey, a worm)! How does this square with the way God chose to bring His son, Jesus into the world? Why does God do this? How does God’s choice of tools impact our understanding of the gospel message? The Tabernacle, after the cross, served a different function than before the cross. From what you know about the Tabernacle/Temple, compare and contrast how they functioned as tools God used in pre/post cross days. How does this affect our understanding of how the church building should function today? Because we do it regularly, there is a sense in which coming to church can become ritualistic. How is coming together as the church more about being the church and not just doing church? After we leave the building how are we still the church?